Well, winter time is creeping up on us here in the capital city. We're reaching into our closets finding our fleeces and coats, hat and scarves and breaking out the Danskos. Like most cities, I guess even small towns too, Columbia has a homeless community. My church houses the Soup Cellar: with the help of volunteers from other churches, the Cellar manages to feed about 200 people a day Monday-Friday. But, we don't have a shelter. The City of Columbia runs a Winter Shelter during the cold months. Our former Associate Minister is very involved in coordinating volunteers to staff the shelter. It opens in the evening and provides a warm bed for the night. They do their best to feed the folks a meal, but have to rely mainly on donations. Last year, my parents began working at the shelter every Tuesday night. My mom feels very strongly that no one should be hungry, so stepping up to help was right up her alley. We put our heads together last winter and reached out to some caterers that we know. After they cater an event, they can't re-sell or re-serve the leftovers. Many of them have had to dispose of tons of food and it kills them to do it. So, we took it off their hands. It was such an awesome blessing to be able to provide BBQ or rice or leftover vegetables turned into a soup. Last night was the "opening night," if you will, of the Winter Shelter. Mom and Dad and their fellow Tuesday nighters got together and planned a hot dog supper. 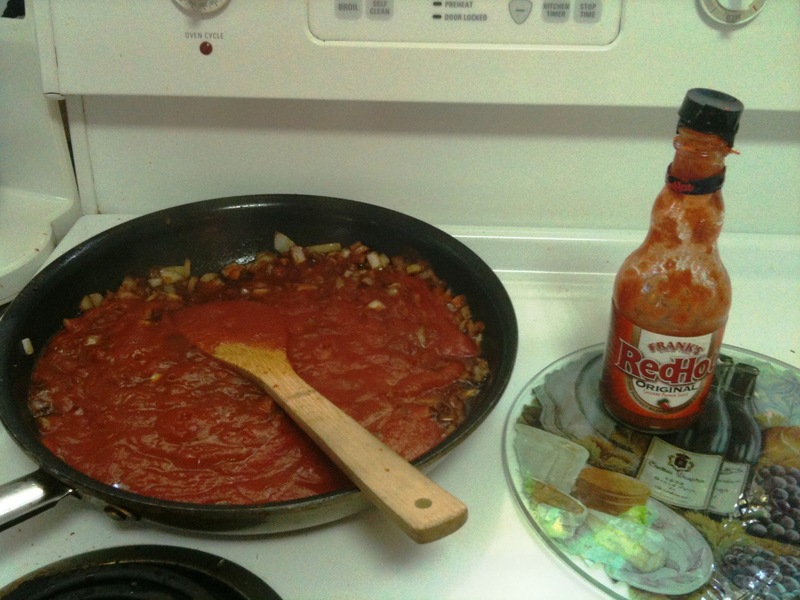 So, yesterday afternoon, I stopped by their house to find mom cooking up batches of hot dog chili. I asked what I could do to help and she said, "how about shred the cabbage for the cole slaw?" Ok, sure. These were no average cabbages, friends. One of them weighed 4 lbs. and the other a mere 6 lbs. I think that green leafy globe was bigger than my head. Uhhh...how exactly do I go about shredding these giants? Ok, food processor. After realizing that I had the julienne blade upside down, things got easier! But despite using this wonderful tool, it was still an insane mess. 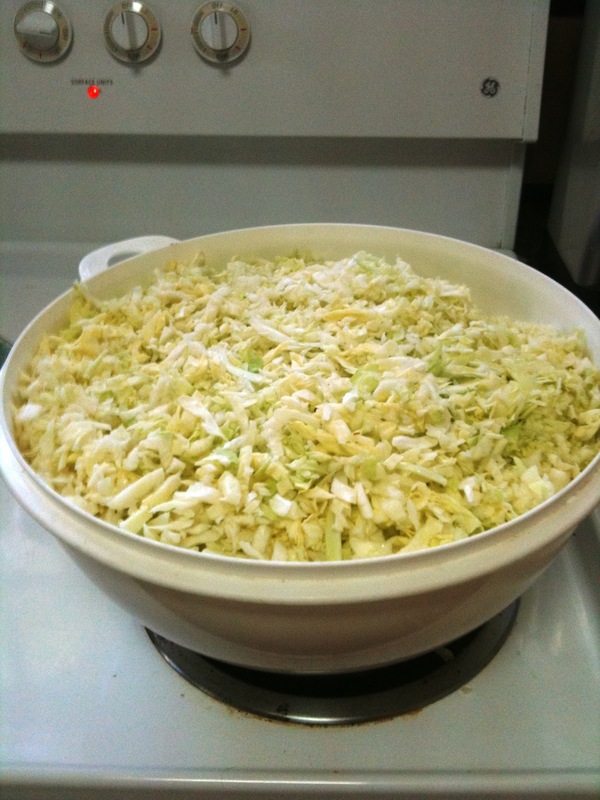 I have never seen so much cole slaw fixin's in my life. Last night I got a call that "my" cole slaw was a huge hit and was completely devoured. They ran out of hot dog buns, so the creativity kicked in and they first went to hamburger buns then on to bread for a hot dog "wrap." I could tell from mom's voice that it was a rewarding evening getting about 100 people in out of the cold weather and getting a meal in their stomachs. And, one of the folks who came in is an old acquaintance of ours. He worked as a handyman when we met him. Apparently, he got very sick and is now down on his luck. I tell you this because it is a reminder to us all that when we see homeless people at the shelter, or at the Soup Cellar or catching some z's in a doorway, remember they are people. They are handymen, single moms, people on disability with all sorts of circumstances that have left them down on their luck. In today's economic mess, it makes me wonder how quickly anyone could have the bottom fall out. Count your blessings, hug your family and donate your time or money when you can. If you're interested in helping at the Winter Shelter, let me know and I'll put you in touch with the right people. Tonight I'll be thanking God for my warm bed and the hot meal that I was able to serve to my family.